Godfrey Banadda was born in 1958 in Kampala, Uganda. He graduated from the School of Fine Art at Makerere University in Kampala with a First Class BA Hons degree in Fine Arts in 1983. 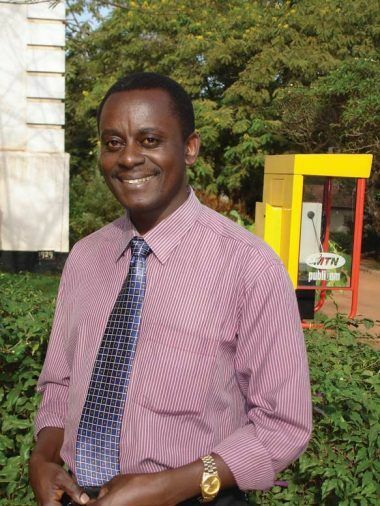 He worked as an art teacher; first at a provincial school and then from 1995 at Makerere University. He is currently Head of Department of Painting. In 1997, he was awarded an MA in Art (Painting) for his major series of works based on Ugandan Deities. Godfrey has been a famous name in Ugandan art for over two decades. In 1987 and 1988 he won first prize in two separate national painting competitions, and in 1989 he held his first solo international exhibition. 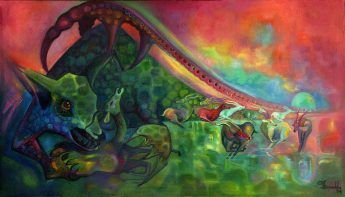 His painting ‘The Last Hope’ was chosen for the Ugandan section of the ground-breaking international exhibition ‘Seven Stories of Modern Art in Africa‘ which toured major cities in 1995-1996. Godfrey has been commissioned to produce over 150 portraits and paintings. Godfrey is one of the most respected names in contemporary African art. His work is unique, incorporating amazing characters and stories from Ugandan culture and mythology into complex masterpieces. Guruve are honoured to represent him in the UK.